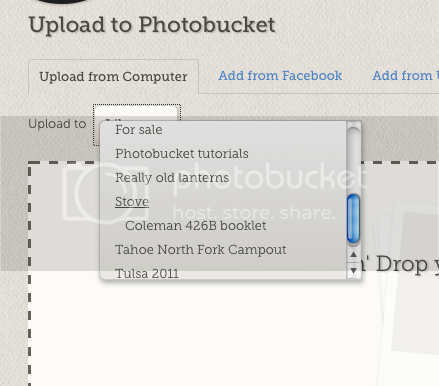 I am revising the PhotoBucket tutorial now that the "New" Photobucket is the only version available. Read through the whole pile, because further down there is a way to make it simpler once you've got the hang of it. It's pretty windy, but I hope that it is somewhat comprehensive, at least for the basics. Some of you may want to just skip down to the section headed "REALLY USEFUL INFORMATION!!" and do it that way right away. I size my photos to around 130kb or so, which is approximately 600 wide x 450 high, so that they don't take too long to load. 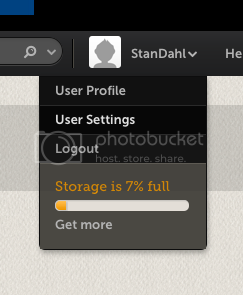 You can probably get Photobucket to resize your photos, but I prefer to do it before uploading. In the Mac, Preview is the program I use to resize photos, if you have a PC, you're on your own - ask one of your kids to do it for you? 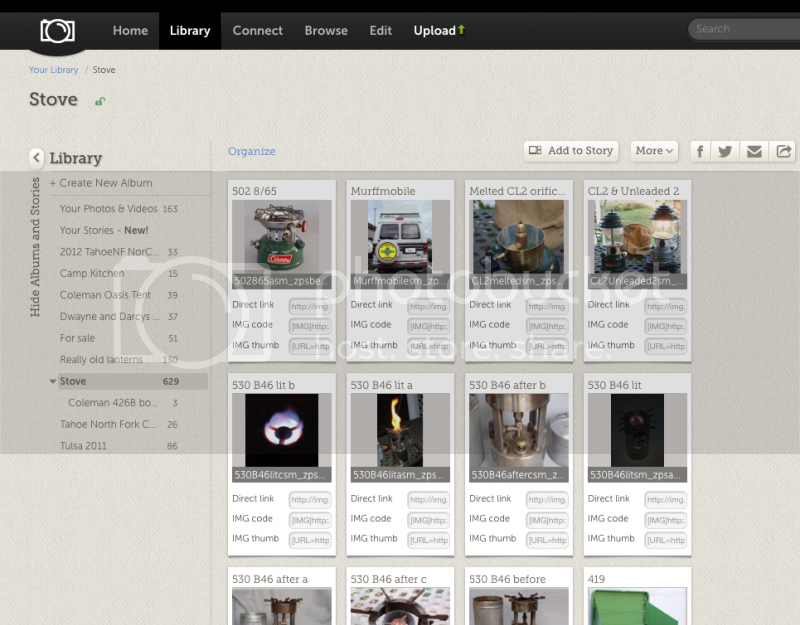 I will highlight a few different methods of posting photos from Photobucket, you can choose what works for you. 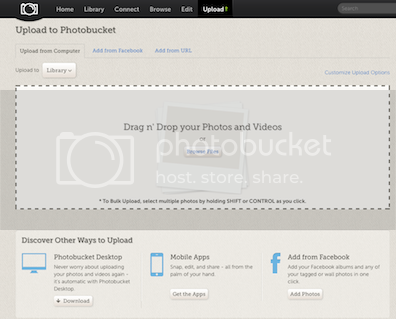 A tip: Photobucket doesn't seem to like long file names or those with punctuation marks, and won't always upload them. If you can't upload a photo, it could be that, or it could be that PB is feeling pissy at the moment. You can either try again later, or eliminate anything non-alphanumeric from your file name. Once you've opened your PB account and uploaded your photos, you're ready to post. 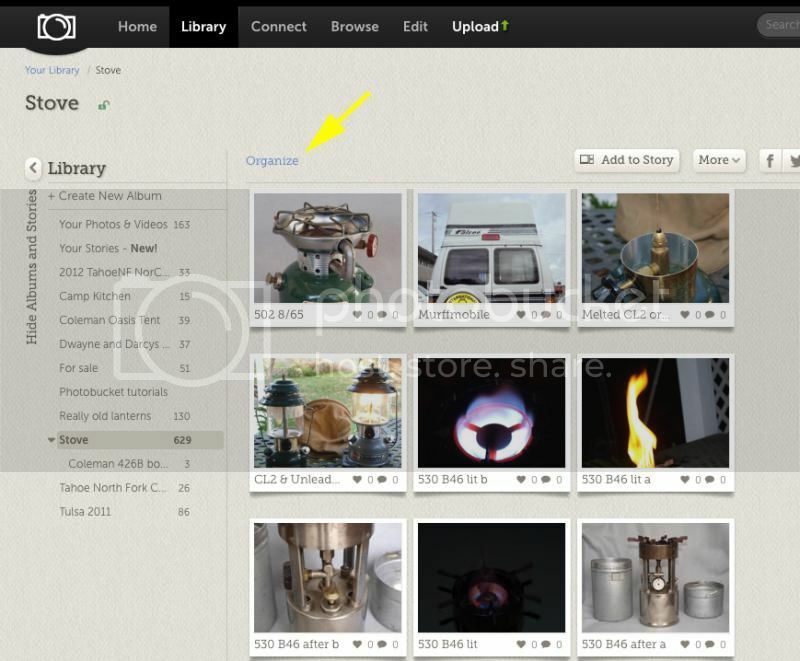 Uploading can be done by dragging a photo (or selection of photos) into the window, or by selecting "Browse File". I usually select "Direct Link" because it puts the photo into your CCF comment window, not a bunch of html gibberish, making editing your post easier. Other methods will be addressed below. Click OK, and you're in business! Little gnomes will shove your photo into the CCF reply window and scurry back into your computer through the aether and wait for your next command. Leave a few donut crumbs and spill a little coffee on your keyboard to keep them happy! 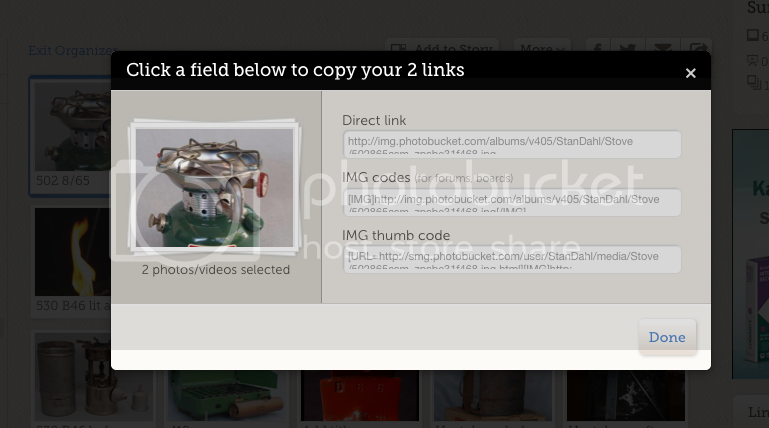 Another, easier way to do this (thanks to bing and magikbus), is to just select "IMG Code" instead of "Direct link". That can then be pasted directly into the reply window without clicking on the Tree icon. However, the actual photo won't show up until you either preview your post, or actually post it. All you will get to see in the Reply box is the URL of your photo surrounded by [IMG]http://.....[IMG]. You can see from the photo above that I used that method - there are no photos in my reply box. It's a pain to do it that way if you've got a lot of photos in a post because you can't actually see them. I personally prefer to see what I've just pasted in there, so I don't find myself commenting on the wrong picture and then have to edit. But you can do whatever hoists your jib. 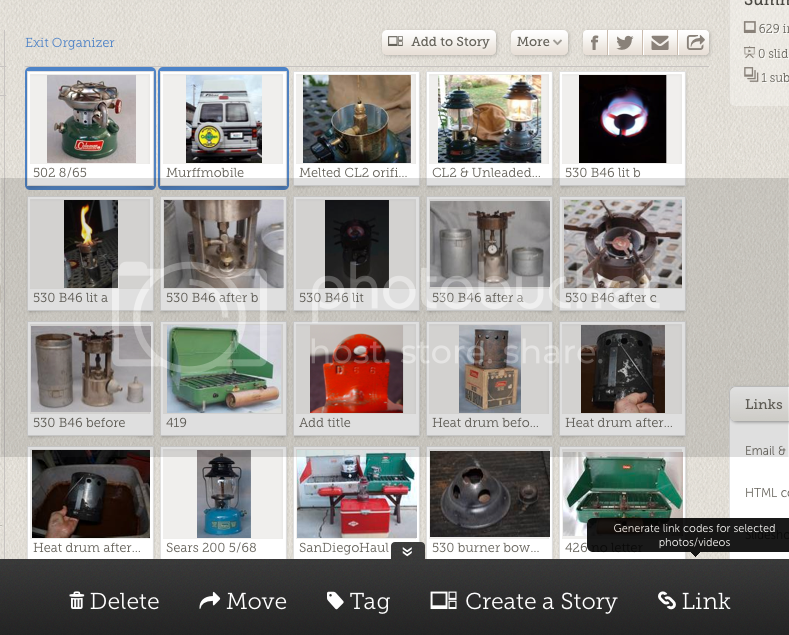 In order to select multiple photos to paste all at once, rather than one at a time, it gets slightly more complicated. Click on the blue text that says "Organize". This will allow you to see your whole album much more quickly than you would in the usual setting, which is nice if you have a slow connection like me. Choose the one you want - "IMG Codes" or "IMG Thumb code" ("Direct Link" doesn't seem to work with the CCF for posting multiple photos at once), and it will copy them for you. You can then paste this directly into your CCF post reply window, but it will show up as the gibberish, not an actual photo. 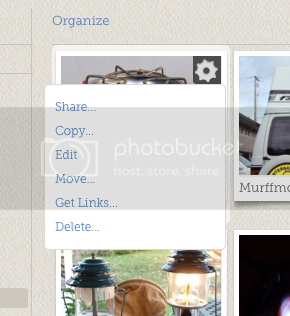 Put a couple of spaces between your photos so we don't have to sidescroll back and forth to read the text. You should seriously think about keeping a separate album for your CCF photos, and not have all of your personal photos on that same album. If you let people into your album, they will snoop around. Once your photos get posted on the internet, they belong to the world! You may find your photo of you and your cat in some PhotoShop contest and become famous - or infamous. 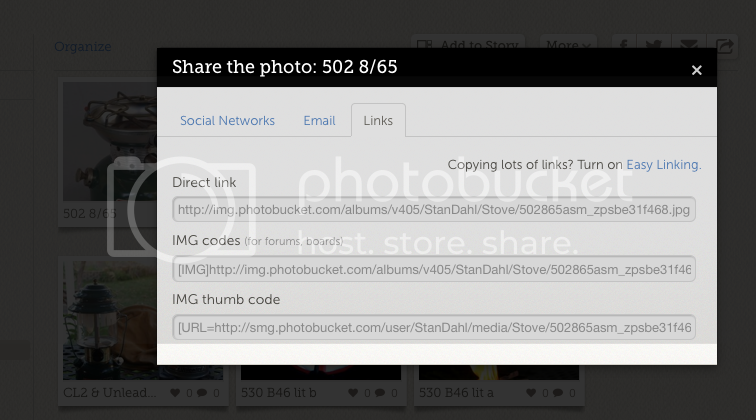 You can now find a photo, and click on any of the choices you have selected and manually copy the link (it isn't automatic anymore). Then paste back in the CCF “Post Reply” window (as detailed above) and you’re off and running. Email & IM: Use this to share your content via email or IM. 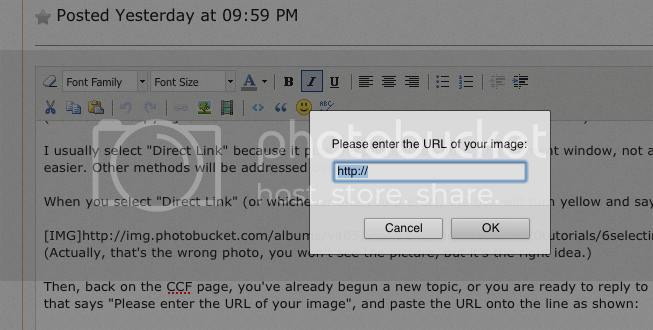 Users can click the link or copy and paste it to a browser to view the image on photobucket.com. Direct link: This is the actual web location where the image lives. Use it if you're on a site that asks you to insert an image from a web URL. You can also use it to create linked text. HTML code: Great for embedding a photo or video on websites like MySpace, Hi5, Blogger, eBay, Craigslist and more! Your media will display at full size on the page you create. HTML thumb: Use this to embed a thumbnail version of your photo (160 x 120 pixels) instead of at full size. IMG code: Use this to embed your photo or video on bulletin boards and forums that do not allow you to input HTML coding. Your media will display at full size on the page you create. 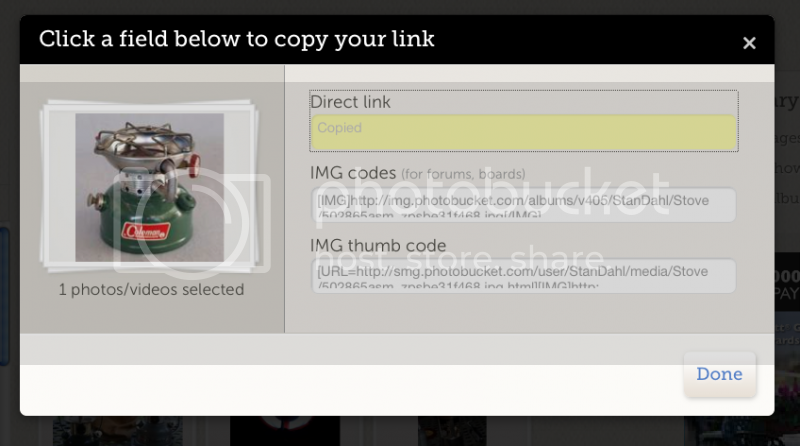 IMG thumb: Just like the IMG code, except a thumbnail version of your photo (160 x 120 pixels) will appear on the page. The link codes appear on the right side of your screen. Left-click on a code to copy it, then paste it into your forum or website source code. You can select whichever of these greases your pan. 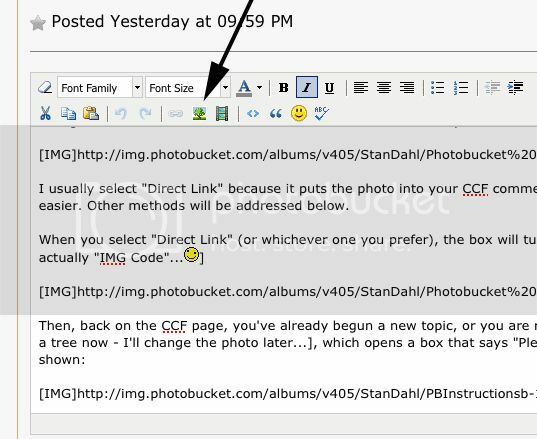 I usually choose "Direct Link" because it puts the photo right into the CCF post window so I can see it as I type instead of putting a gob of code where the picture will appear. Some CCF'rs are annoyed by the extra time it takes to select that, then click on the "tree" icon and insert the photo, so they use the IMG code link.